Planning a trip to Langkawi? Don't spend hours on the web looking for cheap flights and hotels. Use Webjet to browse holiday package deals to Langkawi, Malaysia and find one that suits your budget. Hassle-free Experience: Choose a tailor-made holiday package to Langkawi and take the stress out of planning your itinerary. Save Time: Let someone else handle your flight and hotel bookings, so all you need to do is arrive at the airport and enjoy your break. World-class Service on a Budget: Due to the competitive nature of the travel industry, package holiday deals usually include discounts from the world's leading airlines and hotels. No hidden costs: Your holiday package to Langkawi will be paid in full before you leave for your trip. The cable car ride is one of the island's most popular attractions. The steep ride up stops at the midpoint before continuing to the last platform of stunning panoramic views. At the top, there is also a Sky Bridge, suspended 2,300 feet above the ground, and on a clear day, you'll be able to see all the way to Thailand. There are half day and full day tours that stop at the neighbouring uninhabited islands in the archipelago. You'll be able to explore the lush rainforests, sail down the mangroves and explore hidden caves. Sign up for a visit to the Bat Cave if you want to get up close with the areas gigantic fruit bats. Visit the Telaga Tujuh Waterfalls. Located in the north of the island, you'll have to climb the many steep stairs to reach the Telega Tujah's seven pools. But once you're there, you can take a dip at the top or head back down and view the falls from the lower area. If the weather isn't great for outdoor adventures, make your way to the Underwater World. It's Malaysia's largest aquarium and is home to more than 200 different species of marine life. Plan your visit around one of the feeding times for the seals, penguins or predators. Taste some of the best local treats at one of Langkawi's night markets. Not only is the food cheap, but it's delicious and worth forgoing the traditional restaurant setting. While it's held in a different place every evening, the Kuah and Pantai Cenang markets are the most popular. If you want to beat the crowds, arrive before sunset. The best time of year to visit Langkawi is between November and April. The temperatures are warm, and there's little chance of rainfall ruining any outdoor activities. There's also hardly any wind, making it the perfect time of year for parasailing, snorkeling and scuba diving. Stock up on money before you arrive. There are few ATMs on the island, and it's not uncommon for them to run out of cash. If the ATM network isn't working, you can exchange major currencies at one of the shops in town. Don't drink the tap water. If you want to avoid getting sick on your holiday, stick to bottled water while visiting Langkawi. There isn't much public transportation on the island. 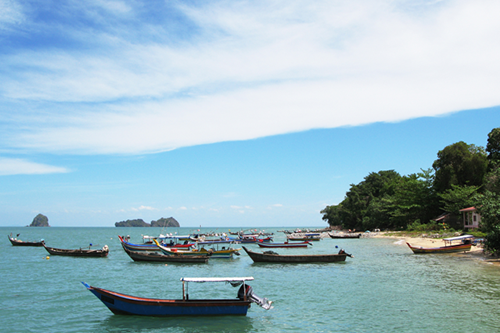 If you want to explore other parts of Langkawi, you'll need to hire a car, use a taxi or rent a motorbike.